If You've Never Read The Enchanted Forest Chronicles, What's Wrong With You? Because I am old and hate new things, I spend a lot of time rereading well-thumbed copies of the books I first read when I was a kid. Sometimes they don’t hold up. Other times they are so great, I get angry that everyone in the world hasn’t read them yet. That’s what happened with The Enchanted Forest Chronicles, at least. I still remember the first time I read Patricia C. Wrede’s Enchanted Forest Chronicles. I was a preteen and, as my habit was back then, I wandered the fantasy section of the kid’s floor of my local library. (No, I didn’t have many friends, why do you ask?) It had a dragon and a princess on the cover and that’s really all I needed to pick it up. This is, by the way, also the process that led me to pick up the other important series of my childhood, Diane Duane’s Young Wizards. Libraries are great. Anyway, I reread the books again over the weekend and they are just as delightful the second time around. We’re living in an age where everyone keeps revisiting fairy tales with modern commentary or villainous backstories, or some other high concept. Wrede did all of that before it was cool—and she did it better. Everyone should replace their tired old fairy tales with these stories. The Enchanted Forest Chronicles is a series of four books (and one short story) that were published in the early ‘90s. Technically the first book was Talking with Dragons in 1985, but it is the last book within the series’ chronology and it was heavily revised in 1995 to make it work better with the other three. The correct order is Dealing with Dragons (1990), Searching for Dragons (1991), Calling on Dragons (1993), Talking to Dragons (1985, revised 1995). 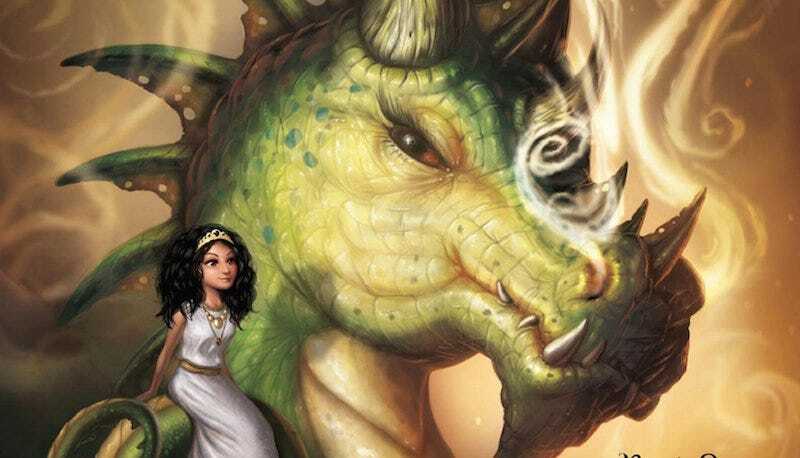 Dealing with Dragons follows Princess Cimorene, who isn’t exactly happy with all the things she, as a princess, is supposed to do. So she sneaks off to learn sword fighting, magic, cooking, politics—basically anything to supplement hours of needlepoint. Eventually she runs away and ends up being the princess of a dragon. Which, in this extremely genre aware book series, is a perfectly respectable way for a princess to pass her time, waiting for a prince or knight to rescue them. As for the dragons, they likewise see having a princess as a minor mark of privilege. Like a purebred dog. Or a maid. What makes the books so great as a child—and eminently enjoyable as an adult—is the brilliant world-building that Wrede did. Dealing with Dragons has Cimorene starting out in a pretty traditional fairy tale kingdom, and slowly ramps up the weirdness. Like a frog who talks, not because he’s a prince but because so many princes have turned into talking frogs, he just picked up the language. Or the dragons having only a king, regardless of the gender of the person chosen, because that’s the name of the job. Why have two names for one job, for no reason? Searching for Dragons is even better in this regard. The actual Enchanted Forest is something between the magical world of straight fantasy and a farce. Its version of Excalibur is an excited puppy that is great at plumbing, bad at not broadcasting its presence to everyone around. The castle is located near the center of the forest because the forest keeps moving around. The castle is also filled with staircases to nowhere, because one king enjoyed sweeping down them in his cape. The greatest superpower in this series isn’t magic or physical prowess, it’s practicality. The villains are greedy and lazy, in that “if you put all the energy you gave to cheating into doing this right, you’d be done by now” way. All of our heroes are competent and practical. Rejection of orthodoxy, in favor of what works best for them, defines every single one of the good guys. We’ve already talked about Cimorene, but there’s also the King of the Enchanted Forest, Mendanbar, who flat-out hates balls and perfectly-appointed dungeons. And Morwen, a witch with every kind of cat except a black one. To be fair, the books aren’t exactly subtle in making their points. And I find the romances to be a bit rushed. But the series makes up for those two flaws, by being hilarious. The series of unfortunate events befalling the rabbit named “Killer” in Calling on Dragons deserves a special mention. And I may love the short story “Utensile Strength”—about the Frying Pan of Doom—more than the books. I put the Enchanted Forest Chronicles up next to Discworld on my shelf of books that never get old. They more than deserve it.